A while ago I had the privilege of assisting a client with some wireless issues they were having at one of their auditoriums. I discovered that they had four Cisco 2602i Access Points in each corner of the space about 12′ feet up and on angle brackets on the wall. From a coverage perspective I knew everything would be fine, but I knew it wouldn’t be able to handle 700 users and made sure the client was aware of the capacity issue. 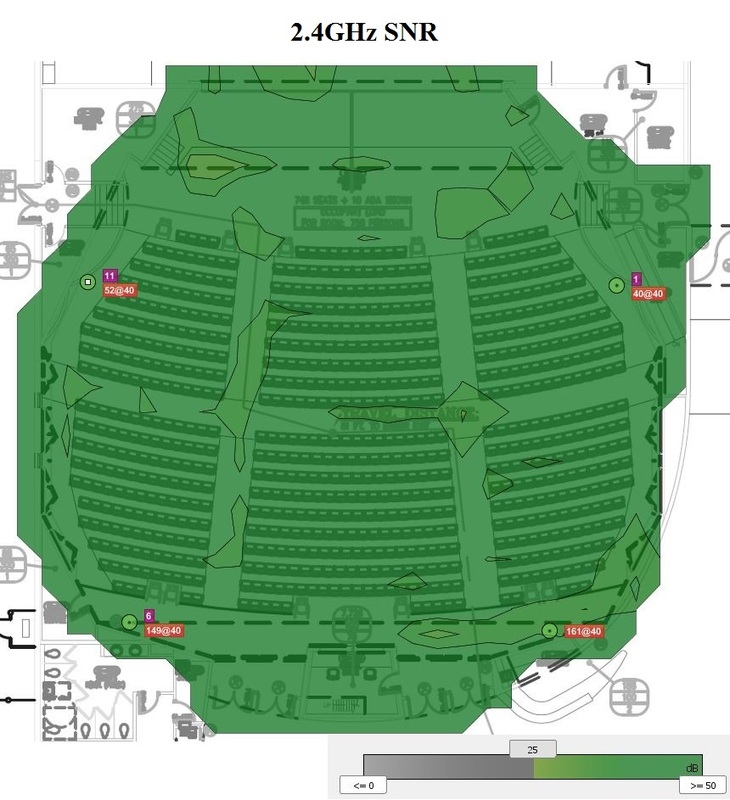 They informed me that they have an upgrade in the works for the near future for high density support, but that the complaints occur even during small events with less than 100 people. Now that I had some of the basic information, it was time to put on my Columbo raincoat and figure out whats going on. I first did a quick passive survey to gather some basic footprint knowledge of the space. See if there are any rogues nearby causing heavy CCI/CCC etc. Of course, everything looked fine. You’ll notice above that the Channel Overlap is a visual representation of any area that see’s two signals on the same frequency at -80 or stronger. 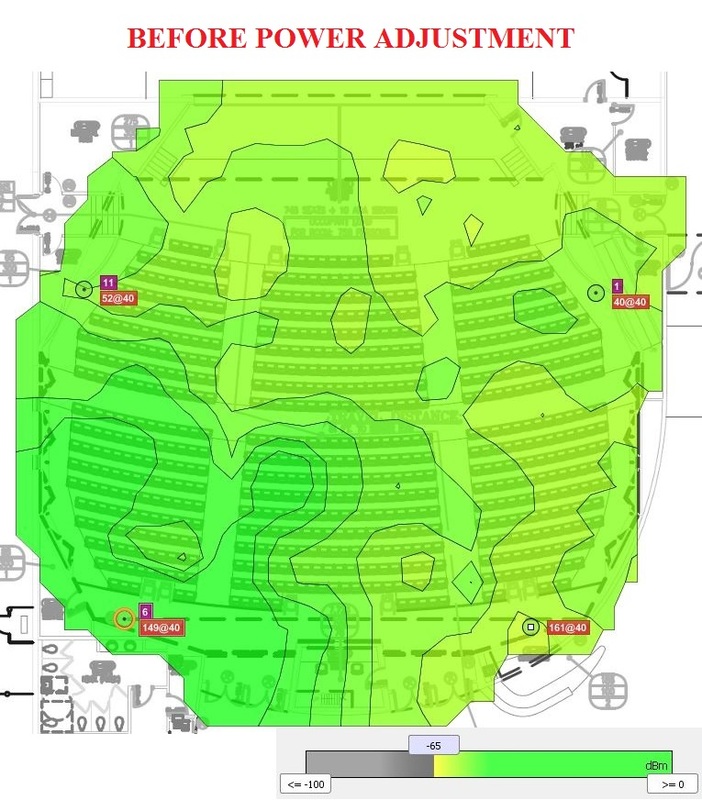 And as you can tell, there are a few gray areas that show that Ekahau detected two signals above -80. The less ‘gray area’ the better. 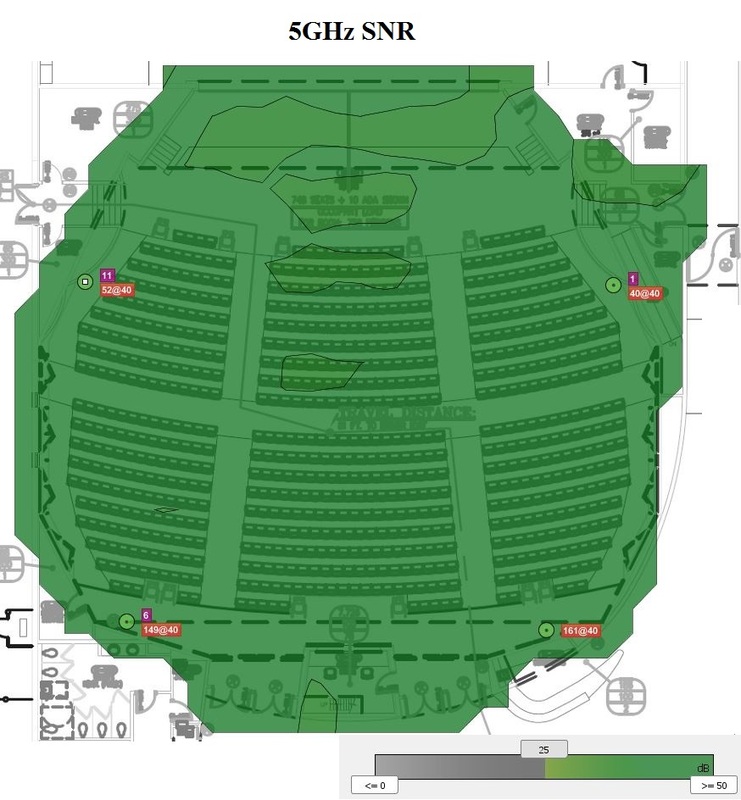 Overall though, there is basically 100% channel reuse available on 2.4GHz in this auditorium because I had disabled one of the 2.4GHz radios (bottom right corner). Here are the results for 5GHz, and again everything looks good. I setup the Access Points to run at 40MHz because there are only four, and nothing else near by, so there was room for it. Based on the survey results…everything looks good. However, because of the complaints, there has to be an underlying issue that isn’t showing up on my surveys. I start up Chanalyzer with my Wi-Spy DBx card and skadoosh! Houston we have a problem. 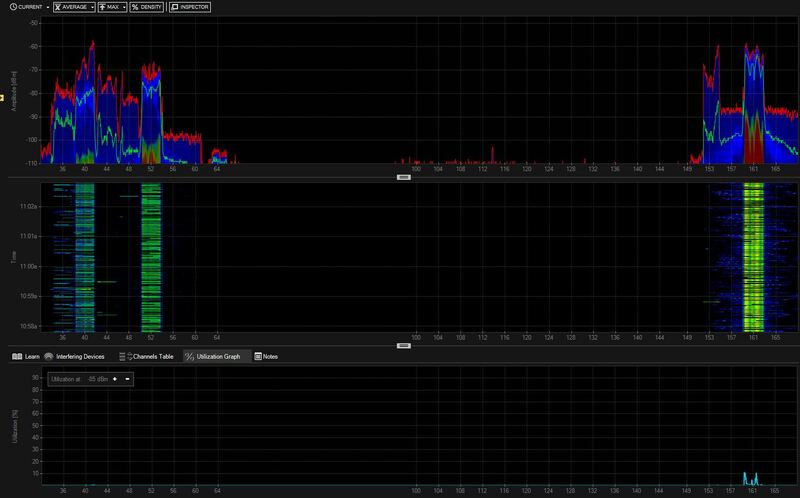 If this isn’t a clear enough example of why you need to check the spectrum while troubleshooting, I don’t know what is. Remember that nugget in the beginning of this post? About how the Wi-Fi is terrible, but not for all users. This is why. 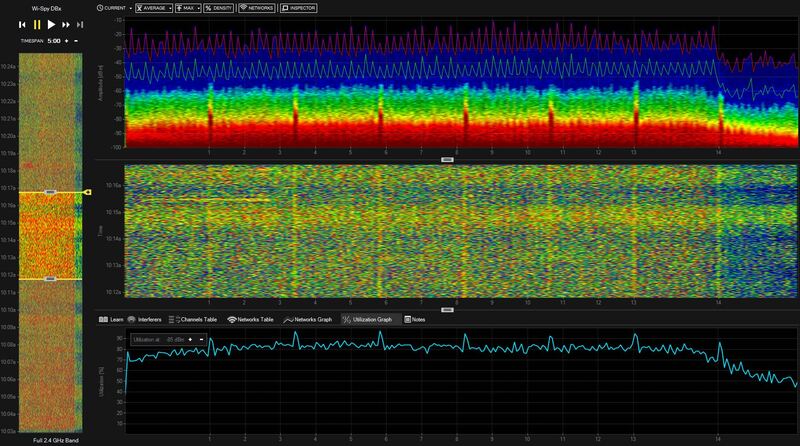 It is terrible for anyone that happens to connect to any of the 2.4GHz radios, but fine for those that are connecting to 5GHz. As it turns out, the root cause of this issue was the lovely audio system somewhere over this rainbow above, that the auditorium uses. It runs on 2.4GHz and the equipment is screaming as loud as it can and frequency hopping like there is no tomorrow. I decided to swap one of the four 2602i Access Points from Local Mode into SE-Connect Mode and connect to it via Chanalyzer’s CleanAir function to get a better view. The Wi-Spy DBx card works, but it lacks clarity and I like my high definition. 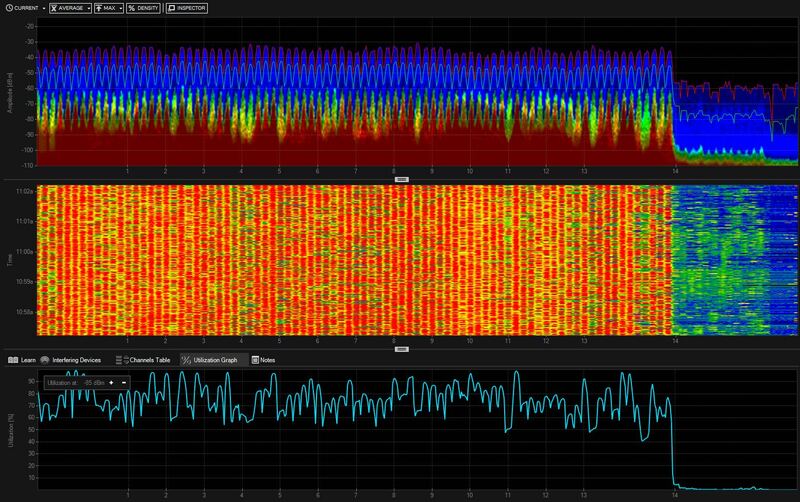 I can’t wait for Metageek to pump out a new USB card that supports Cognio chipset in the future (or so I’ve heard). 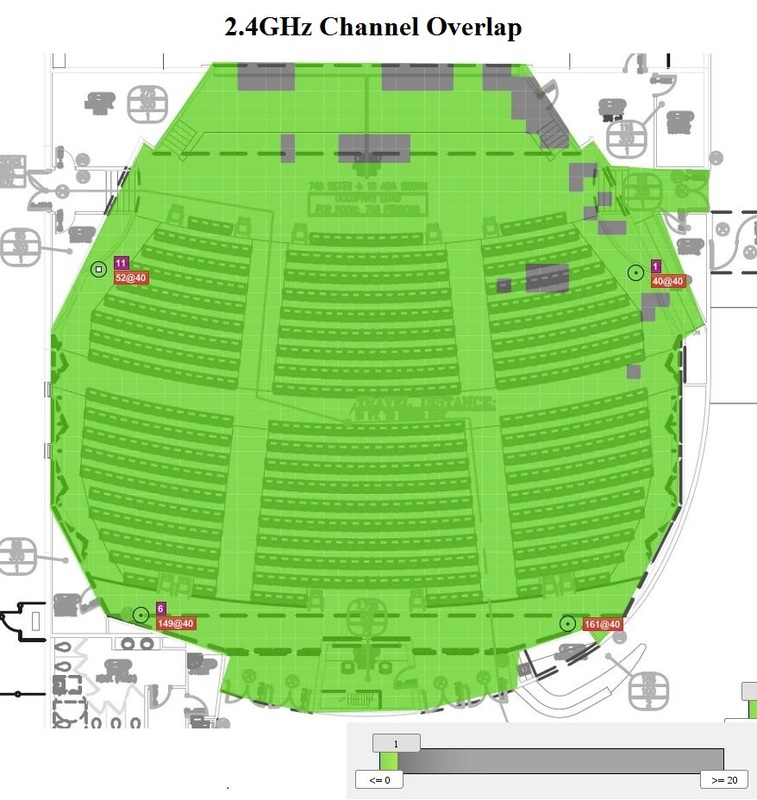 Here is how the Access Points in the room see the RF. Delicious. I was curious to see how much of an impact this had for the unlucky souls that connected to 2.4GHz, so I setup a ping test to Google and ran a speed test to the Internet on both bands by forcing my laptop to connect to 2.4GHz only, and then 5GHz only. The audio system people refused to budge on changing anything, so at the end of the day the only solution to this issue was to disable all 2.4GHz radios on all four of the access points (and any future ones added). No more complaints from end users, and that = good. 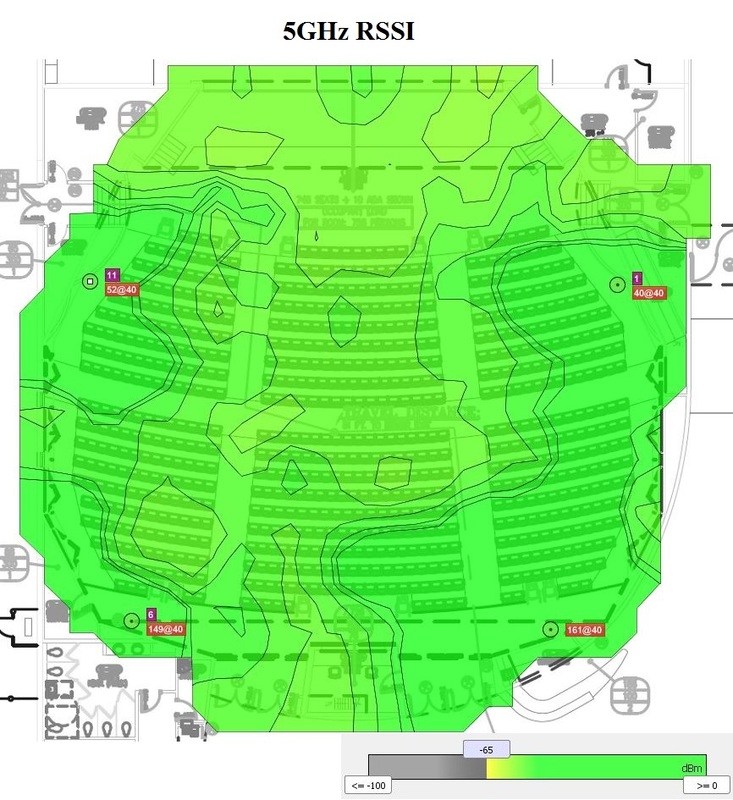 I also tweaked the power adjustments for the 5GHz radios because they were too loud and I wanted to try and persuade devices to lean to connecting to the Access Point closest to them based on their location in the seats. 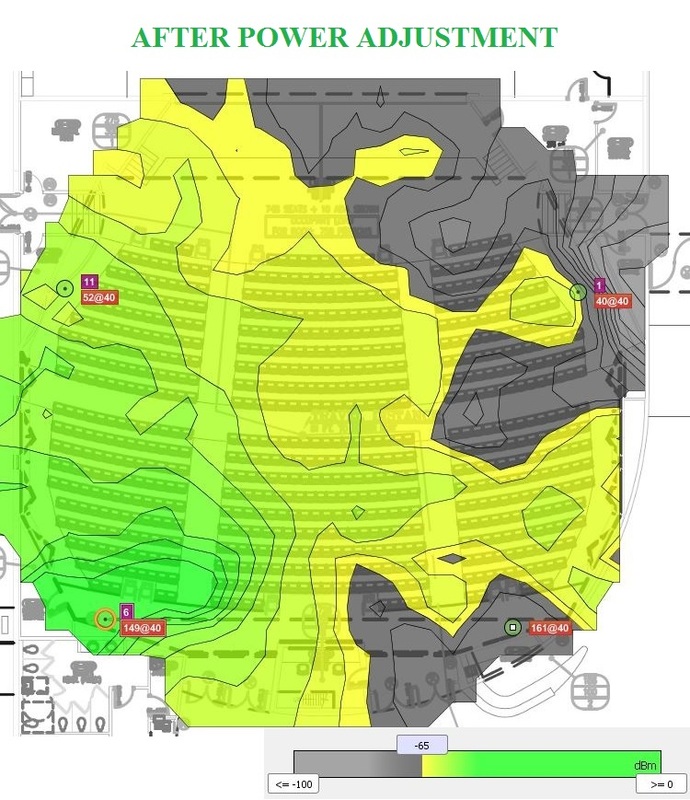 It’s not the best way to shape the RF, but it was the only option and until a proper high density survey can be done, that was the only option I had at the time. 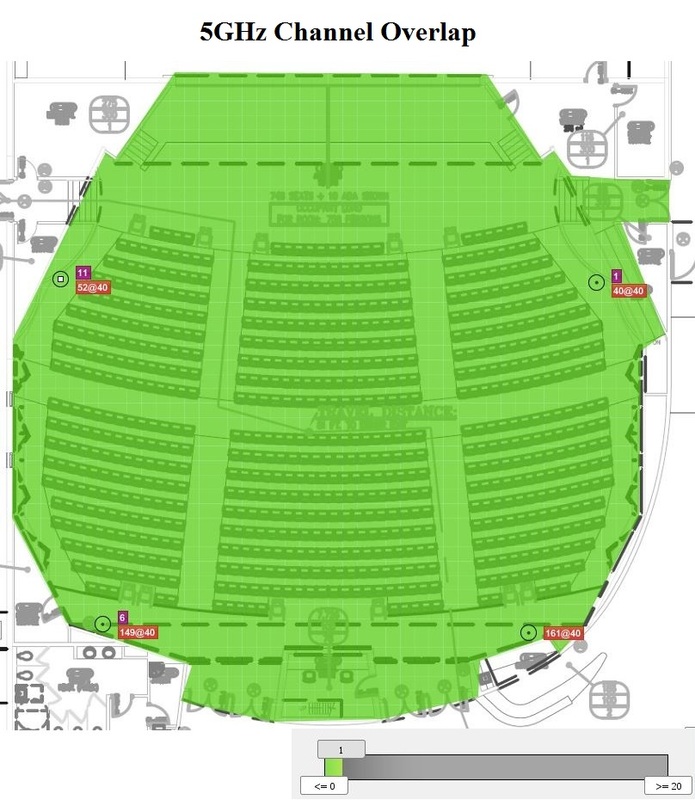 Below is an example of the before and after with the bottom left Access Point only being shown. ← Cisco WLC Software – Which do I choose?!? !